Hi folks, I found this and thought it might be useful to some of you. Personally I love having my feet massaged, and find it extremely relaxing. 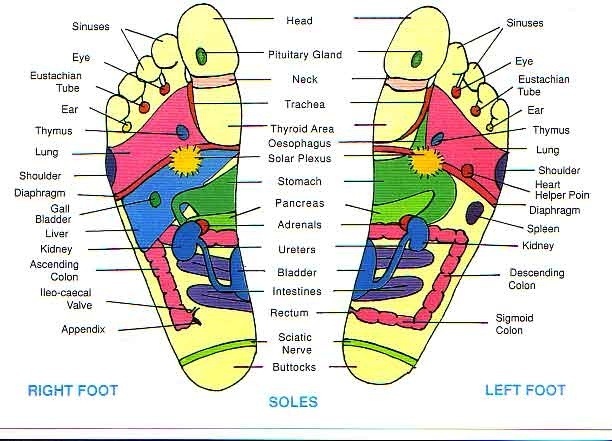 This image shows the different areas to massage, to help and heal different parts of the body. Blog Roll Antiphospholipid Blood Test Central Nervous System Diagram Did You Know? – Neuro Plasticity… FMD What’s the difference between the overlapping movement disorders? Thank Foot Massaging FUNCTIONAL MOVEMENT DISORDER! Awareness Week 17th to 23rd May. Gabapentin Tablets May Be My Problem! It’s Our Awareness Week!!! The Brain Does Change During A Psychogenic Episode!